Best Ergonomic Keyboards For 2019 - You Should Buy Now! 2.12 Why should you own one of the ergonomic keyboards? 2.12.0.1 And your welfare matters! The more you work at our workstations there is one important thing you must take into consideration. That is, your posture as incorrect posture leads to stress injuries. This is where the best ergonomic keyboards in 2019 offers you supreme typing to lessen the strain on your muscles. They make sure that you keep your hands in a natural position without unnecessary bending. To make this able the space on the keyboards left empty in the center of certain ergonomic keyboards. This prevents your wrist from bending and remains aligned with your forearm. While other keyboards have a palm rest or rounded base to help make your hands feel comfortable. Another highlight is that some models have both a Negative Tilt and Vertical Tenting for you to customize. In the end, they help you to arrange yourself in a proper form and investing in one of the ergonomic keyboards here is the best choice you will make. We have selected the best of the best to make you feel comfortable with advanced features and easy to use. The keyboards reviewed here received an overall consumer satisfaction from different users online. The Adesso Tru-Form 150 has a three-color illuminated backlit key design with a great price. There are two large print keys, Internet and Multimedia keys. You can type quietly on key switches with the no noise membrane. The AKB-150EB has a sleek curved design that is illuminated and corded with visible letters. Not only does it give you a tactile feel, but also you can buy such ergonomic keyboards at an affordable price. For a natural typing experience without the stress placed on your forearm or wrist, you need the Microsoft 4000 Natural ergonomic keyboard. The palm wrests cushioned to promote a natural wrist position. The keyboards designed with different media keys to control music and videos. The Microsoft 4000 ergonomic keyboard is comfortable to use and offers you loads of extras. The keys are quiet and the built-in wrist rest has a perfect slope. If you are a Mac user, you will find the Kinesis Freestyle2 Blue ergonomic keyboard more than pleasing. With the wireless design, you can connect to your MacBook in no time. If you want convenience in an ergonomic, keyboard the Freestyle 2 Blue model will not disappoint you. The keyboard is a multichannel device that works with Bluetooth and suitable to use with Mac. If you need a comfortable keyboard to use in your business, the Microsoft Sculpt 5KV-00001 has an ergonomic design with a split keyset. If you need the best ergonomic keyboard then you will be pleased with the Microsoft Sculpt 5KV-00001 model. The keyboard is easy to use and setting up the device is flawless. The Goldtouch GTN-0099 V2 is an adjustable ergonomic keyboard you can use with your PC. The unit adjusts from 0 to 30° in a horizontal and vertical position. This helps you to straighten your wrists for a natural position. The Goldtouch V2 has an ergonomic design and has no numeric pad present. With the special keys, you do not need to look down when type and take care of edits with ease. Another split adjustable ergonomic keyboard from Kinesis is the Freestyle2 without a wireless connection. The keyboard has a standard 9-inch separation. If you need to type comfortably and fast, the Freestyle2 keyboard is what you need. This split keyboard keeps your hands relaxed and works quietly. 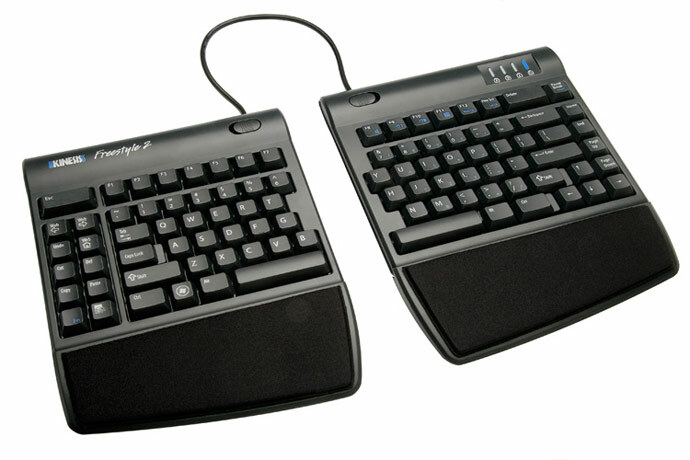 Another Kinesis Freestyle2 Blue Wireless Ergonomic Keyboard offering more versatility when used is the 20-inch one. This split-adjustable design separates at 20-inches for a comfortable typing experience. If you care about your posture while working the Freestyle2 20-inch adjustable keyboard takes care of everything. The great thing is you can connect it to three different Bluetooth devices and switch between them with ease. 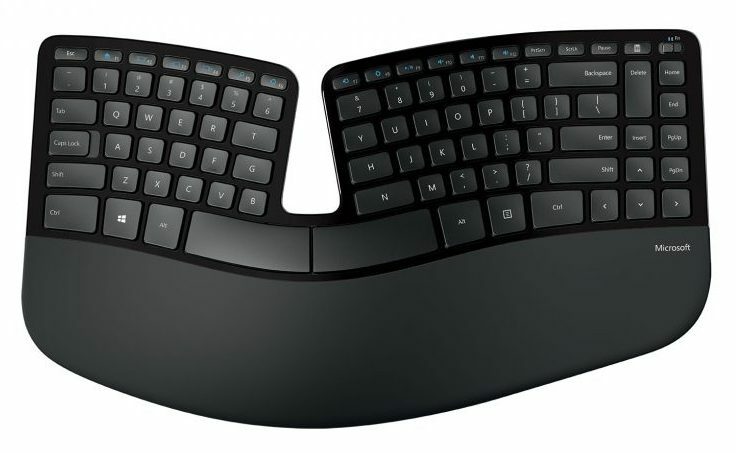 The Logitech K350 wireless keyboard has a wave design with a constant curve layout. The palm rests cushioned for working easier making it comfortable to use. 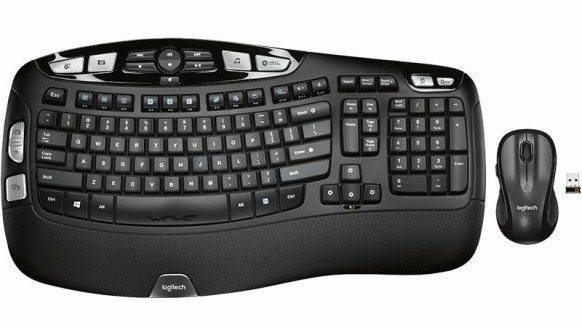 There is a variety of ergonomic keyboards in different designs but the Logitech K350 wireless keyboard has an ergonomic design with an easy learning curve and an affordable price. One of the best ergonomic keyboards you can buy in 2019 is the Logitech MK550 Wave Combo model. This combo set includes the K350 keyboard with an M510 mouse. 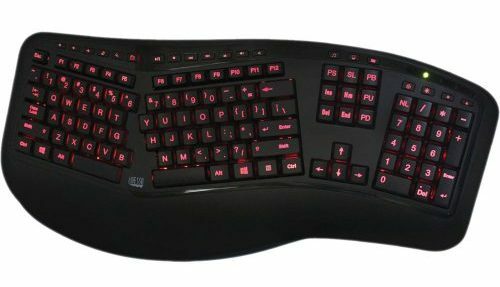 This is a well-designed keyboard and mouse to use at home. While the cushioned palm rest is comfortable for working on your computer all day. The Fellowes split design wired keyboard has a Microban antimicrobial protection to keep the device clean. For fast typists, it has a 16-character buffer with seven added hotkeys. The Fellowes ergonomic keyboard has extra multimedia keys with a comfortable split design and the keys have a nice soft touch. 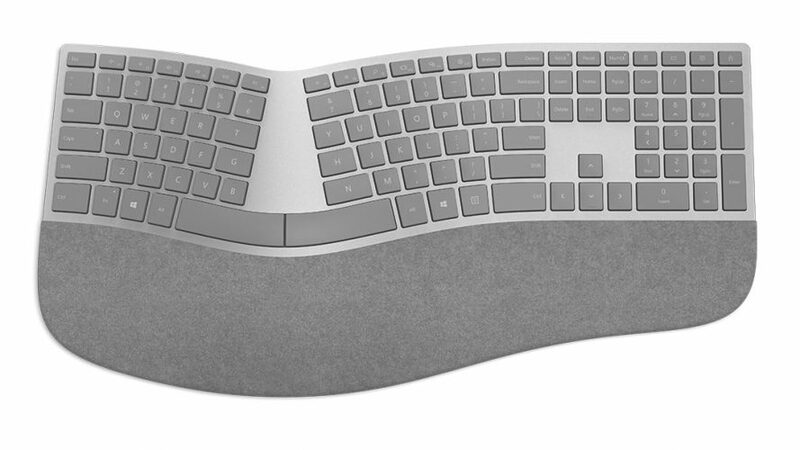 The Microsoft Sculpt Ergonomic Desktop Combo includes a split keyset with a mouse. There is a cushioned palm rest and the keyboard has a domed design. This is simple to use split keyboard with built-in shortcut keys and includes a spherical mouse. Not only does it give you a comfortable use but is cost-effective at the same time. The Microsoft Surface Ergonomic Keyboard is compatible with Surface Book, Surface Pro 4, and Surface Studio. The unit has a natural arc and slopes with double-cushioned palm rest. 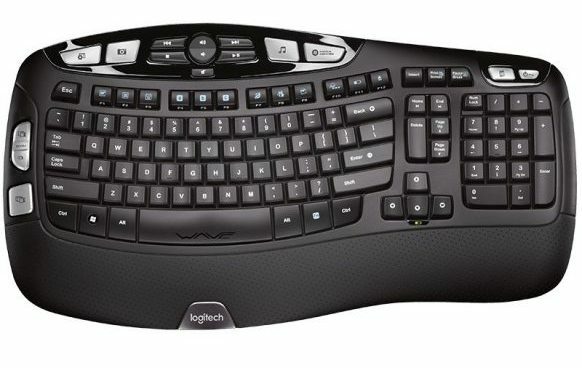 This ergonomic keyboard has a built-in number pad and has an excellent build quality. The keys give you a tactile feel and have outstanding feedback when used. 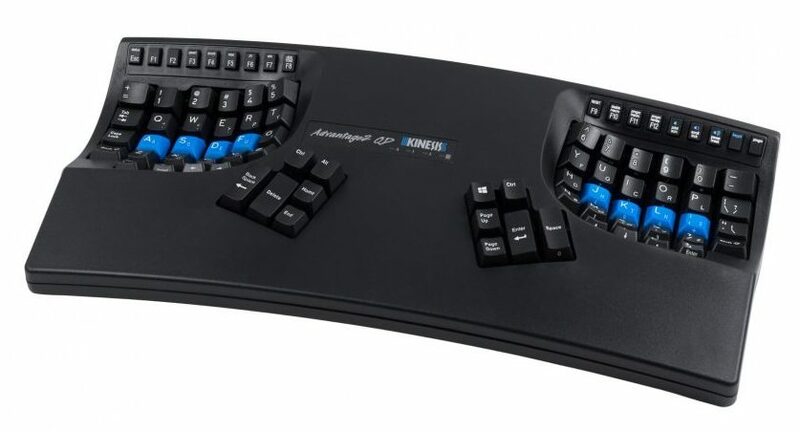 If you have the money to spend, choose the Kinesis Advantage2 KB600. This is the best experience of most ergonomic keyboards available. With the patented contour, you get outstanding comfort when typing. This is one of the top ergonomic keyboards currently sold in 2019. It is a beast of a keyboard, the keys placed well, and the thumb cluster buttons have a clever design. Why should you own one of the ergonomic keyboards? No matter what type of work you do, you spend hours in front of your computer. You sit in one position most of the time and if not set up correctly it can lead to discomfort in your overall health. The biggest problem most computer users face is Carpal Tunnel Syndrome. This is very sore, as the median nerve is the wrist causes numbness in the fingers and hands. The best way to combat this ailment is to use an ergonomic keyboard. The keyboard has keys angled outward and keeps your arms bent in slightly while your wrist remains straight. 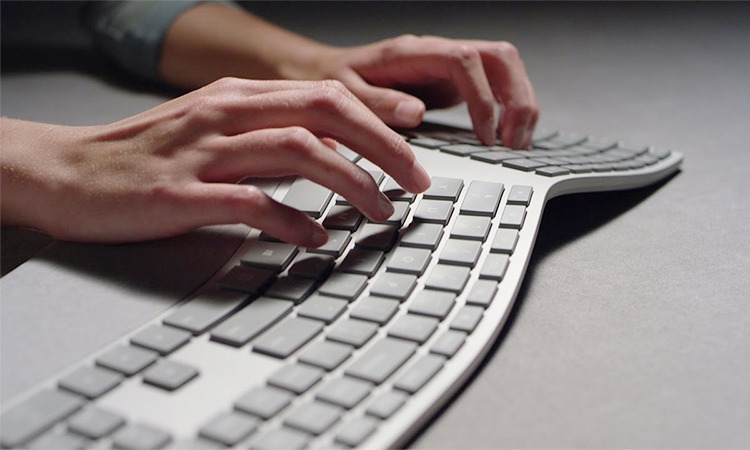 The keyboard allows you to line your wrists up with the keys and normally have a split design. You can buy them in a fixed or adjustable design. The adjustable model allows you to adjust the angle of the keys. 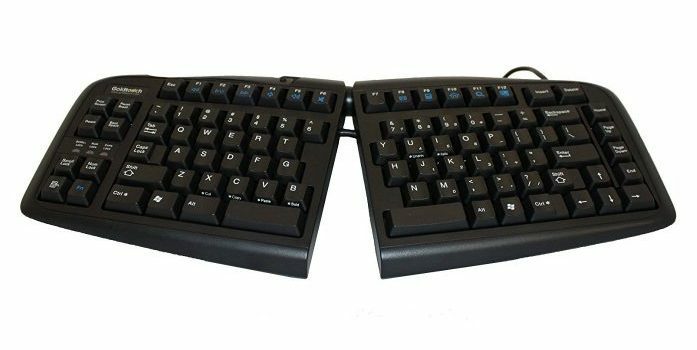 Using, for instance, the Kinesis Keyboard allows you to have each section up to 9-inches apart and you can adjust each sections angle. 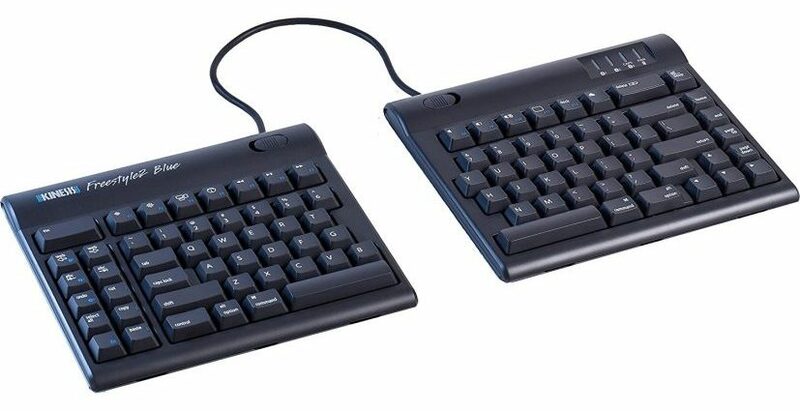 While the standard fixed split keyboard such as the Microsoft Natural 4000 Ergonomic model has a superb build quality. The 4000 model is easy to use and has the home cluster available in a standard position. There is a padded palm rest with a riser for a comfortable use. 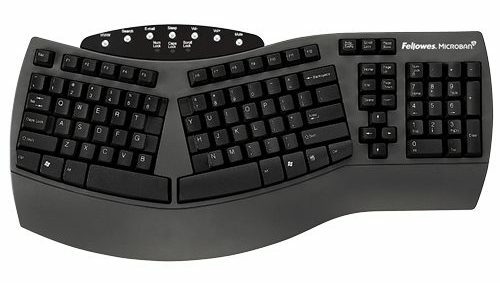 No matter what type of work you do in front of your computer, you need the best ergonomic keyboard in 2019 to prevent unnecessary pain. We hope that our list of ergonomic keyboards available here help you to find a comfortable one to get your work done. Prevent strain in your arms, wrists, hands, neck, and shoulders by changing over to an ergonomic keyboard and start throwing away your standard one – you will not be disappointed.